When Facebook rolled out the ability to reply to comments on Facebook, my immediate reaction was ... indifferent. Actually, I thought it was more likely it would complicate conversations and give spammers additional ways to pollute comment sections. But then I changed my tune when I saw the potential for a fun marketing activity -- Facebook Chats! Similar to a Twitter Chat, a Facebook Chat is a scheduled time to, well, "chat" with a group of people about a particular topic on Facebook. With the introduction of the new Facebook reply feature, users could actually have conversations in the comments of a post. Users could reply to comments, Like comments, and make it immensely clear who they were responding to and which point they were addressing. Shortly after this light bulb went off, we hosted four Facebook Chats -- we wanted to get the kinks out before we shared it with you -- and now we're ready to explain how you can host your own. Settle in to learn how easy it is to host a Facebook Chat for your business. One More Time ... What's a Facebook Chat? Now that we're on the same page, let's review what you would need to host an actual chat. Goal: Why is this chat taking place in the first place? Are you trying to increase engagement on your page? 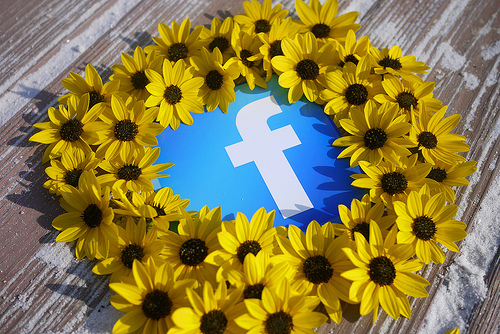 Are you looking to grow your Facebook reach? Do you want to help promote a particular campaign you're running? Topic: What will people be discussing in the chat? 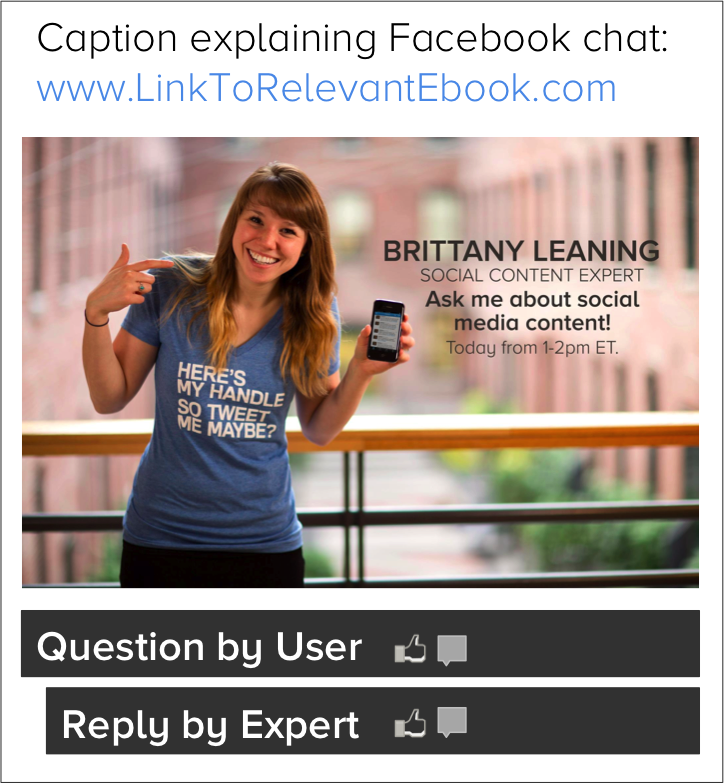 Will it need a subject matter expert to moderate and answer questions, or will your social media manager suffice? Call-to-Action (CTA): Your chat should have a clear next step. Whether that's following your page on Facebook, reading a blog post on more relevant content, downloading an ebook, or accessing a discount code to an event, make sure you're giving those who engaged with you a destination to head to next. With that in mind, here's how to host your own Facebook Chat. Pick a topic. You'll obviously want to pick a hot topic that your audience cares about. At HubSpot, we're asked about our content creation process often, which is why we held our first Facebook Chat on that subject. Pick an expert. Ask someone at your business, or in your network, who has deep knowledge on the selected topic, to be your chat expert. This person should be able to quickly respond to the questions that emerge. Facebook Chats are live, which means scripted responses won't fly. Promote the date and time. Give your fan base at least a day's heads up as to when the chat will be held. Unlike a workshop or webinar, there's no form to fill out or ticket to purchase with a Facebook Chat, so folks can just jump right into the conversation. Create a dedicated web page. This page should host information relevant to the chat, whether that's just relevant chat information, or a specific content offering you want to give attendees. If you want to provide a content offering to help generate leads, you'll want to make this page a landing page with a form. Create a campaign tracking token. As mentioned earlier, use this tracking token every time you promote the dedicated landing page so you can track and measure chat impact on your overall marketing. Host the chat on a status update. Post about your chat topic on Facebook at the beginning of the chat, and make it clear that attendees can simply comment with their questions on the status update itself. Then have your expert reply to the comments with the Facebook reply feature. Monitor the conversation. Even if you have an expert responding to questions, ensure someone is available on that chat acting as a more neutral moderator. There will be questions that your expert may not have time to attend to, or may not be suited to respond to, so you can help out by linking to relevant resources (include that tracking token!) and responding where possible. Measure the impact. Use the campaign tracking token to look at how the chats performed. You can also dig into your Facebook Insights to see how that particular post performed compared to your other Facebook posts. After hosting four chats that first week of April, we found a few immediate things that might help you to know before you host your own chat. Responding in real-time ain't easy. It's hard to predict what kind of questions you'll hear on the chat, or what people will say. Make sure your expert is able to handle quickly responding to diverse questions. He/she will need to not only be comfortable speaking on the fly, but able to respond eloquently when doing so. Facebook comments do not operate in real-time. Even though you're responding in real-time ... Facebook is not. After you respond to a question, you'll have to refresh your browser to load the latest comments and replies on the chat. You may not get to every question. As helpful as you'd like to be, you may not be able to answer every question. Due to the time it takes to respond to a single question, you may miss questions that emerge while you respond. Try your best to interact with fans, but realize you may have to regretfully miss some -- otherwise you'll be on Facebook all day! Others will jump in to help. Fortunately, the world is full of brilliant minds. You may notice some users jump in simply to respond to the questions people are putting forward. Welcome these folks! Don't be afraid to thank them for helping respond, and share your thoughts on their responses, too.